Top Gear is like Marmite, you either love it or loathe it and I have loved it for as long as I can remember and you may remember that for Christmas Paul & I were gifted 2 tickets to the live show. After a few mini heart attack moments after Clarkson’s contract was not renewed by the Beeb earlier this year the day of the show finally arrived at the weekend. Conveniently the show that we had tickets for was at the fantastic Motorpoint Arena in Sheffield, just a short drive from the M1 and Meadowhall so it only took us around an hour to get there from home and we had pre-paid car parking at the arena and so headed straight there. The show itself was everything you would expect from the not Top Gear, Top Gear show and the three stars of the show really played up to their current ‘unemployment’ situation and almost successfully managed to complete just under 2 hours without even mentioning the show previously known as Top Gear! 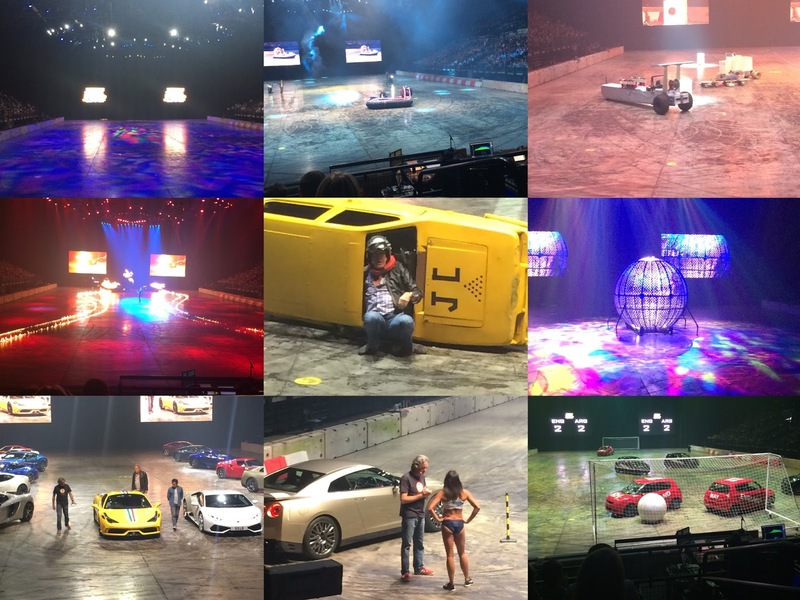 There was everything you would expect from a live motoring show from Clarkson, Hammond & May; big entrances, lots of clowning around, power, fire, horsepower and even an Olympic Athlete which you probably wouldn’t expect. I don’t want to give too much away incase you are looking forward to seeing the terrific trio later in the year but I think if I had to pick one part that really stood out it would be the super brave motor bikers. I can’t believe it took me this long to take in the live show having loved the series for as long as I have and I am so thankful to those that had the idea to gift the tickets at Christmas.